Bowsers Double Donut. 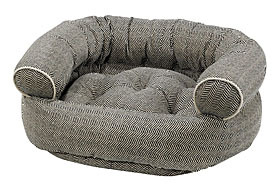 Bowsers has doubled up on all the features of the best selling donut dog bed. The upper bolster is finished off with piping to create an upholstered, elegant sofa look. The removable, orthopedic foam insert provides additional support, together with a separate tufted cushion. 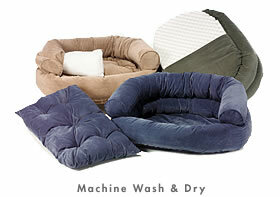 Zippered covers make it easy to toss the covers in the wash to freshen up. Mat washes separately. Custom: Please contact customer service for information. Allow 4 + weeks for custom orders to ship.